Human activities associated with urbanization have negatively affected the biodiversity of native plant communities globally. Establishing native species assemblages on green roofs may help conserve native plant diversity in urban areas, but these assemblages are susceptible to colonization by species from the surrounding landscape. In natural communities, colonization from the regional species pool reflects the filtering effects of both abiotic and biotic factors, but the relative effects of these factors on green roof colonization are not well-understood. To address this knowledge gap, we studied colonization dynamics of 10 green roofs in New York City (NY, United States), each established at the same time with the same source materials. On each roof, 12 plots were established, with one-half of each plot planted with an erect C4 graminoid dominant (Hempstead Plains: HP) and the other half with a tuft C3 graminoid and forb dominant (Rocky Summit: RS) species assemblage derived from native communities. Six of the 12 split-plots contained shallow growing medium, while the other six contained deeper growing medium. Resident plants were planted in October 2010. Fifty-eight non-resident plant species colonized plots between August 2011 and August 2012, with two native and 10 non-native species accounting for 90% of total colonist dry mass. Colonist dry mass and richness decreased with increasing resident plant cover, but the effects of growing medium depth on colonist dry mass and richness differed between assemblages. Forbs accounted for 81% of the colonist dry mass from the HP assemblage, but just 31% in the RS assemblage. Further, forbs accounted for over 95% of colonist dry mass in June and July, while graminoids accounted for over 95% of colonist dry mass in August. These results indicate colonization of planted green roofs may be strongly affected by the composition of established plant assemblages and that these effects may vary temporally with colonist management regime, even within a single growing season. Further, the inconsistent effects of growing medium depth suggest that niche overlap and complementarity in rhizosphere dynamics may influence colonization more in some systems compared with others. Additional research is required to describe the effects of colonist management strategies, as well as the roles of priority effects, niche complementarity and community assembly, on long-term dynamics of colonization on green roofs planted with native plants. Urbanization has led to the loss and redistribution of native plant communities globally due to a suite of factors associated with the built environment (Williams et al., 2009; Kendal et al., 2011; Aronson et al., 2014; Pataki, 2015). For example, urbanization is associated with declines in native species diversity as disturbance-adapted cosmopolitan species increasingly dominate plant communities in urban areas (Clemants and Moore, 2003; Aronson et al., 2015). Drawing on the large amount of rooftop space in urban areas (Sanderson and Brown, 2007), one approach proposed for conserving native plant species in these areas is the establishment of native plant assemblages on green roofs (Oberndorfer et al., 2007; Butler et al., 2012). However, native plant assemblages on green roofs are negatively affected by multiple factors (Dvorak and Volder, 2010; Butler et al., 2012; Aloisio et al., 2017), including colonization by plants not part of the planted (“resident”) assemblage (Köhler, 2006; Dunnett et al., 2008; Olly et al., 2011; Nagase et al., 2013; Madre et al., 2014). Because many non-native plant species may outcompete and displace native species (Kinlock et al., 2016), using green roofs to conserve native plant species in urban areas requires a better understanding of non-native plant colonization patterns of green roofs planted with native plants. A key factor affecting colonization of green roofs may be the abundance and composition of resident plant species, just as priority effects affect colonization in natural systems (Chase, 2003; Fukami, 2015). For example, in grasslands, increased resident plant cover has been shown to decrease colonist species richness (Foster, 2001; Milbau et al., 2007), and specific growth forms, such as C4 graminoids, may limit colonization more than other growth forms (Fargione et al., 2003; Bresciano et al., 2014). Moreover, the dominant growth form of resident species may lead to colonization by complementary growth forms, due to competition by similar growth forms (Macarthur and Levins, 1967; Fargione et al., 2003; Smith et al., 2004). Therefore, on green roofs, resident assemblage cover and composition may cause predictable patterns of colonist composition. Further, because resident plant cover may decrease with decreased growing medium depth (Aloisio et al., 2017), depth of media also may affect colonist composition. Growing medium depth limits growth, survivorship, and diversity of planted resident species on green roofs (Monterusso et al., 2005; Getter and Rowe, 2008; Nagase and Dunnett, 2010; MacIvor et al., 2013). However, the effect of growing medium depth on plants colonizing from the environment is more ambiguous, as colonist taxonomic diversity has been observed both to increase (Madre et al., 2014) and decrease (Dunnett et al., 2008) with increased growing medium depth. In both studies, disturbance-adapted and annual species were common colonists, and these species generally are less affected by green roof growing medium depth than perennial species (Olly et al., 2011; Aloisio et al., 2017). Differences among studies in the effect of growing medium depth may also reflect differences in belowground competition between resident plant assemblages and colonizing species, much as niche overlap and complementarity in rooting depth may affect invasion and community assembly in native plant communities (Moles et al., 2008; Maire et al., 2012). However, few studies have compared the interactive effects of resident plant assemblage composition and growing medium depth on green roof colonization. Accordingly, further disentanglement of the effect of green roof growing medium depth on colonization is needed. Understanding the factors regulating green roof colonization is further complicated because plant composition varies inter-annually as well as during a single growing season (Köhler, 2006; MacIvor et al., 2013; Benvenuti, 2014; Heim and Lundholm, 2016). For example, a 20 year study of green roof plant colonization found composition varied inter-annually in response to water availability (Köhler, 2006), and differences among species in response to water availability may cause shifts in composition within a growing season in native communities. For example, early season water availability affects competitive ability among plant species and can increase plant diversity in grasslands (Chesson et al., 2004; Wainwright et al., 2012). Phenologic differences among colonizing species and the timing of colonist removal may also affect colonist composition over the course of a single growing season. Moreover, because colonist recruitment depends on the available species around a green roof, these patterns may differ among roofs. Geographically-separated urban green roofs may have distinctly different species pools due to variation in species composition across urban areas. Furthermore, because the richness of the species pool may vary with patch size (MacArthur and Wilson, 1967; Crowe, 1979; Hobbs, 1988; Zobel, 1997; Thompson et al., 2004), an increased proportion of green space around a green roof may increase colonist richness on the roof. In addition to the effects of compositional differences among species pools on green roof colonization, recruitment from species pools likely is affected by mechanisms (e.g., wind, animal) that regulate plant dispersal to an elevated green roof (Dunnett et al., 2008). Despite these sources of potential variation in green roof colonization within a city, few studies have examined variation in green roof plant colonization across a single city. To address these issues, we characterized plant colonization over a single growing season on 10 green roofs in New York City (NY, United States), established at the same time with the same source materials, including growing medium. Each roof was planted with two resident (intentionally planted) native plant species assemblages at two growing medium depths (see Aloisio et al., 2017). Due to differences in resident assemblage composition (C4 graminoid or C3 graminoid/forb dominant), we hypothesized that (i) colonist dry mass, richness, and composition would differ between the two assemblages and would co-vary with resident plant cover. Due to the widely-observed effect of growing medium depth on plant survivorship and growth on green roofs, we hypothesized that (ii) colonist dry mass, richness, and composition would differ between growing medium depths. Due to seasonal variation, we also hypothesized that (iii) colonist composition would differ among sampling periods. Finally, due to urban landscape heterogeneity, we hypothesized that (iv) colonist composition and richness would differ among green roofs, and that (v) colonist richness would co-vary with the proportion of plant cover surrounding each green roof. This study was conducted using established green roofs on 10 New York City (NYC) Department of Parks and Recreation buildings in NYC, NY, United States, as described in Aloisio et al. (2017). All 10 green roofs were constructed at the same time, using the same source materials. On each roof, 12 wooden framed (Cedar) experimental split-plots (2 × 4 × 0.15 m, L × W × H), with a wooden divider in the middle forming the split (Supplementary File 1), were placed on a rubber impervious layer (Ram RB 20, Barrett Company, Millington, NJ, United States). A 1 cm thick drainage mat (Ram Drain 1241, Barrett Company, Millington, NJ, United States), which also served as an impervious root layer, was laid inside each of the frames. Two target depth treatments, 10 cm (n = 6) and 15 cm (n = 6), were randomly assigned to the 12 split-plots on each roof and filled accordingly with growing medium (Supplementary File 2). Although the initial design was six split-plots per roof filled with growing medium to 10 cm depth, and the other six filled to 15 cm depth, variable precision during installation and a combination of compaction and erosion led to realized depths between 6.1 and 16.6 cm across all 120 plots, with a mean (± 1 SE) of 11.0 ± 0.2 cm when measured 2 years after installation. However, growing medium depth still differed between plots designated as “10 cm” (9.4 ± 0.1 cm) and “15 cm” (12.7 ± 0.2 cm; t = 15.714, P < 0.001, Students t-test). Initial growing medium contained 4% organic content (dry mass) and very likely retained a seed bank. Two different plant communities of conservation interest, the “globally rare” Hempstead Plains (HP; Edinger et al., 2002) and the “limited acreage” Rocky Summit grasslands (RS; Swain and Kearsley, 2001), were used as the basis for the resident plant assemblages. Each assemblage (HP or RS) was composed of three graminoid species, four non-nitrogen fixing forbs, and a nitrogen-fixing forb (Aloisio et al., 2017; Supplementary File 3). Plants were propagated in sterilized media by the NYC Greenbelt Native Plant Center (Staten Island, NY, United States) from a mixture of seeds collected from multiple source populations throughout the region. One side of each split-plot was randomly assigned to (HP) and the other side assigned to (RS). Assemblages were planted in October 2010, and consisted of 100 total individual plugs in a completely randomized matrix (10 × 10), with 20 individuals each of two “dominant” species and 10 individuals each of the remaining six species (Supplementary File 3). During the first year after planting, plant colonists were removed to facilitate native species establishment. In August 2012, the surviving resident plants were cataloged following the methods described in Aloisio et al. (2017). The three most abundant resident species in the HP assemblage were two erect C4 graminoids [Panicum virgatum L. and Sorghastrum nutans (L.) Nash] and one prostrate C4 graminoid [Schizachyrium scoparium (Michx.) N], while the three most abundant species in the RS assemblage were a C3 tuft graminoid [Danthonia spicata (L.) P. Beauv. ex Roem. & Schult. ], an erect nitrogen-fixing forb (Lespedeza capitata Michx. ), and an erect clump-forming non-nitrogen fixing forb (Pycnanthemum tenuifolium Schrad.). Split-plots were assigned to one of four treatment categories based on the resident assemblage and target soil depth (resident × depth; n = 40). During 2012, plant colonists were manually removed in the beginning of June, July, and August. Manual plant removal was conducted by hand-pulling, with the intent to remove all below ground biomass. To minimize the amount of growing medium removed from plots during colonist removal, growing medium was shaken off harvested material, and bare roots were cut into pieces and left on the surface of the split-plots from which they were collected. Manually removed colonist shoots were brought to the lab and sorted by species (Uva et al., 1997; Magee and Ahles, 1999; Del Tredici, 2010; Barkworth et al., 2013) based on the four treatments (n = 4) per site (n = 10) per time period (n = 3). Species names were verified using the Taxonomic Resolution Services (iPlant Collaborative, v.3.2; Boyle et al., 2013), and voucher specimens were prepared and stored in the herbarium at the Louis Calder Center, Fordham University, Armonk, NY, USA. Voucher specimens were dried and weighed separately; the dry mass of each voucher specimen was added to the dry mass of the relevant sample to calculate the total dry mass of that species for each experimental unit. To calculate dry mass, all above ground plant colonist biomass was dried at 80°C for 48 h and weighed. Resident and colonist percent cover were estimated according to Aloisio et al. (2017). Plant colonist species richness (colonist richness) was calculated at treatment and roof levels. To examine the effect of landscape structure on differences in the response variables among green roof sites, it was necessary to define the size and shape of each set of green roof plots because the shape of each roof was non-uniform and, as a result, plot layouts differed among roofs. The perimeter of plots on each roof was estimated by placing a central point in each plot using GoogleEarth. The perimeter of plots on each roof subsequently was used to quantify the proportion of green space around that roof at four radii of 50, 100, 200, and 500 m. To quantify surface proportions, we used a high-resolution map of NYC provided by the United States Department of Agriculture Forest Service, Northeastern Research Station (Newtown Square, PA, United States), using the buffer and clip toolbox functions in ArcDesktop 9.3 (ESRI Inc. Redlands, CA, United States). The map included four land cover types, tree/shrub, grass/herbaceous, impervious surface, and water, with a pixel-size of 0.81 m2, that were generated using a hybrid classification method (Myeong et al., 2001). All statistics were completed in the R environment (ver. 3.1.0, R Development Core Team) in RStudio ver. 0.97.551 (RStudio, Boston, MA, United States), and α was set at 0.05 for all tests. To account for the nested factors in the experimental design that cause pseudoreplication (Hurlbert, 1984), the lme4 package (Bates et al., 2012) was used to perform mixed effect analysis. The random effects of the experimental design were roof nested within sampling period (Barr et al., 2013). Assumptions of normality and homogeneity of variance were assessed by visual inspection of predicted vs. residual plots. To address violations of homogeneity of variance, colonist species dry mass data were log-transformed prior to all univariate analyses. To test if colonist dry mass and richness differed between resident assemblages and depended on plant cover, we used a two-way linear mixed effect model (LME) analysis of covariance (ANCOVA) using the lmerTest package (Kuznetsova et al., 2013) and the step function, which estimates P-values calculated from F statistics of type 3 hypotheses using the Welch-Satterthwaite approximation for degrees of freedom. To test if colonist composition differed between resident assemblages, permutational multivariate analysis of variance (PerMANOVA) was used with the adonis function in the Vegan package, with dry mass of each colonist species as the dependent variable, assemblage and depth as independent factors, and roof as a nested effect. Prior to multivariate analysis, sampling periods were pooled to generate a single species composition matrix and singleton species were removed from the colonist composition matrix to reduce variance and false positives (Braaker et al., 2014); this modification reduced total species in multivariate analyses from 61 to 50 and was used for all subsequent multivariate analyses. To visualize colonist compositions and elucidate patterns, we used non-metric multidimensional scaling analysis (NMDS) using the metaMDS function in the Vegan package v. 2.0-7 (Oksanen et al., 2013), based on a Bray-Curtis dissimilarity matrix. We tested resident plant cover, colonist cover, colonist richness, and colonist species dry mass (30 most abundant species) vectors for significant correlations with the NMDS ordination using the envfit function in Vegan with 999 permutations and fitted significant variables to ordination plots. To further examine the effect of resident assemblage on composition, the proportion of colonist growth form (graminoid or forb) between each resident treatment was compared with a Chi-square test by applying the prop.test function. To test if colonist dry mass and richness differed between treatment depths, separate LME and generalized linear mixed effects (GLM) models were used, respectively, for each resident assemblage, and P-values were generated using the likelihood ratio test (Bates et al., 2012; Crawley, 2012). To test if colonist composition differed between growing medium depths, PerMANOVA was applied, as described above. To test if colonist composition differed among sampling periods, PerMANOVA was applied, as described above, except the colonist composition matrix used for this analysis contained un-pooled data from each month (n = 120). To test if colonist composition differed among roofs, PerMANOVA was applied on pooled composition data (n = 40), as described above. To test if colonist richness differed among roofs a kruskal.test was used to perform a Kruskal-Wallis (K-W) test. To test if colonist richness increased with an increased proportion of plant cover surrounding each green roof, linear regression analysis using the lm function with the total proportion of green space in 50, 100, 200, and 500 m radii around roofs were used. Two years after planting two native plant assemblages, each containing eight native species, 58 additional colonist plant species were recorded across all 10 roofs in the study. Of the 58 additional colonists, the US Department of Agriculture classifies 33 as “introduced,” 21 as “native,” and two as “both,” while two specimens were not identifiable to species. Additionally, three of the original 16 native plant species, Rudbeckia hirta L., Dichanthelium clandestinum (L.) Gould, and S. scoparium, colonized plots in which they were not initially planted. Singleton species represented about 20% of the total species richness, but only accounted for about 1% of the colonist dry mass. By contrast, the top five most abundant species during each sampling period (12 unique species in total) accounted for nearly 90% of the colonist dry mass (Table 1). Table 1. Species identity and growth form of the 20 most abundant (total dry mass) plant colonist species collected during summer 2012 from 10 green roof sites planted with two eight species resident plant assemblages derived from two plant communities that occur within the New York City metropolitan region, Hempstead Plains (HP), and Rocky Summit grasslands (RS), established at two treatment depths. Colonist dry mass decreased with increasing resident plant cover (P = 0.011) and was higher in the HP compared with the RS treatment (P = 0.036; Figure 1). While colonist richness decreased with increasing resident plant cover across treatments, colonist richness responded more to plant cover in the RS compared with the HP treatment (P = 0.028; Figure 1). 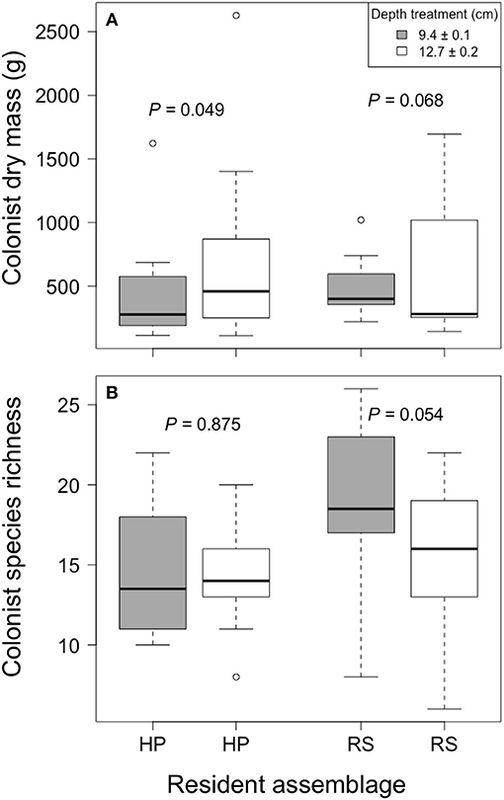 Colonist composition differed between resident treatments (P = 0.001; Figure 2). The RS treatment exhibited more colonist cover and species, as well as more dry mass of several colonist species, both graminoids and forbs, while the HP treatment exhibited more resident cover (Figure 2). The dominant colonist growth form, based on dry mass, also differed between resident treatments (χ2 = 50.895, P < 0.001). Forbs accounted for about 81% of the colonist dry mass in the HP treatment, while graminoids accounted for about 71% of the colonist dry mass in the RS treatment. Figure 1. The effect of green roof resident (R) plant species assemblages (Hempstead Plains, HP; or Rocky Summit, RS) and percent cover (PC) on colonist dry mass and richness of 10 green roofs across New York City. Figure 2. Non-metric multidimensional scaling (NMDS) ordination displaying the effect of resident assemblage (Hempstead Plains, HP; or Rocky Summit, RS) on colonist composition, with significant (P < 0.05) vectors proportional in length to their r2-value. Vectors are coded as: col.richness, colonist richness; col.cover, colonist cover; res.cover, resident assemblage cover. Colonist dry mass increased with increased growing medium depth only in the HP treatment (P = 0.049; Figure 3). By contrast, colonist dry mass appeared to decrease with increased growing medium depth in the RS treatment, though this pattern was not statistically significant (P = 0.068). 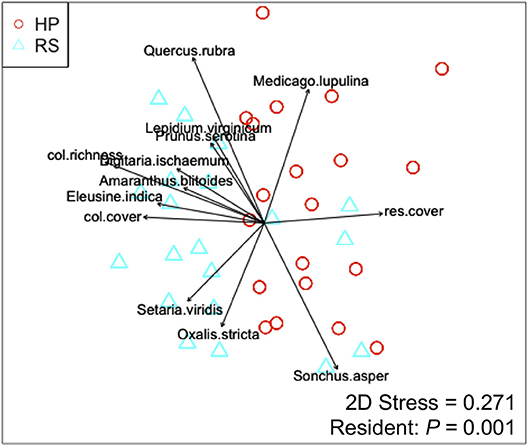 Similarly, colonist species richness in the RS treatment appeared to decrease with increased depth (P = 0.054), though this pattern was not statistically significant, and colonist richness did not clearly vary with depth in the HP treatment (P = 0.875). Moreover, colonist composition did not clearly differ between depths (F = 0.833, P = 0.567, PerMANOVA). Figure 3. The effect of growing medium depth on colonist (A) dry mass and (B) richness in two resident assemblage treatments, Hempstead Plains (HP) and Rocky Summit grasslands (RS), collected during summer 2012 from 10 green roofs established in New York City in 2010. Colonist composition (F = 16.975, P = 0.001, PerMANOVA, Figure 4A) and species richness (χ2 = 29.35, P < 0.001, K-W) differed among sampling periods. Across all roofs in June, 46 colonist species were recorded, with a total dry mass of 11,883.4 g (12.4 g/m2), while 33 colonist species were recorded across all roofs in July, with a total dry mass of 1102.8 g (1.1 g/m2), an order of magnitude decrease compared with June (Table 1). In August, total colonist dry mass was 9786.6 g (9.49 g/m2), while colonist richness remained relatively unchanged compared with July, at 32 species. June colonist composition was similar to July, but both differed from the August harvest, based on NMDS analysis (Figure 4A). 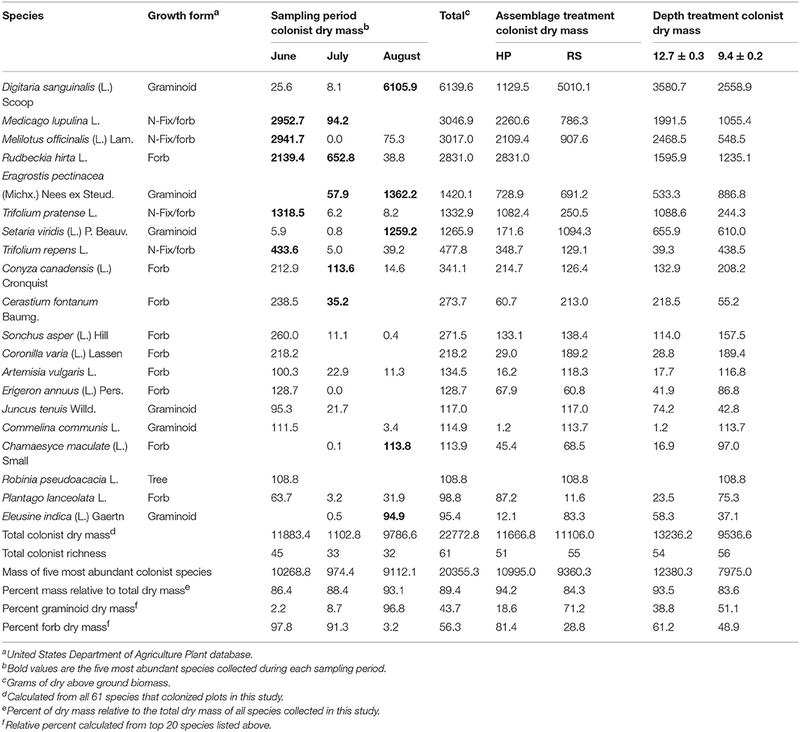 Forbs accounted for about 98% of the colonist dry mass in June and 91% in July, while graminoids accounted for about 97% of the colonist dry mass in August (Table 1). Figure 4. Non-metric multidimensional scaling (NMDS) ordination plots displaying the effect of (A) sampling period and (B) roof on colonist composition. Plot (A) was generated using colonist composition from each month (n = 120) and plot (B) was generated by pooling colonist composition among all months (n = 40). Roofs are coded as: B, Brownsville; C, Chelsea; H, Hansborough; JR, Jackie Robinson; LB, Lost Battalion; LP, Lyons Pool; S, Sorrentino; SJ, St. John's; SM, St. Mary's; SP, Sunset Park. Colonist richness (χ2 = 18.17, P < 0.001, K-W) and composition (F = 2.776, P = 0.001, PerMANOVA, Figure 4) differed among roofs. Species richness ranged from 15 (Chelsea) to 37 (Lyons Pool). While ten colonist species were recorded on all roofs, 38 species were recorded on four or less roofs. Of the 20 most abundant species, three species are dispersed by wind (Canyza canadensis, Sanchus asper, and Erigeron annuus). Colonist richness did not clearly vary with the proportion of plant cover surrounding each roof at each measured distance (50 m: F = 0.237, P = 0.639; 100 m: F = 0.461, P = 0.516; 200 m: F = 0.670, P = 0.547; 500 m: F = 0.923, P = 0.365, Supplementary File 4). A wide range of plant species colonized the green roofs in our study, with disturbance-adapted species accounting for the majority of colonist biomass. The dominant colonist species differed between the two resident plant assemblages, indicating that the characteristics of the resident assemblage strongly influenced patterns of colonization. In contrast, while previous studies have suggested that growing medium depth is a key factor influencing patterns of plant colonization on green roofs, the effect of growing medium depth was statistically significant for only one measure of colonization in our study, colonist dry mass, in one of the two resident assemblages. Although our study did not address the mechanisms underlying the comparatively small depth effect, the characteristics of resident and colonizing species coupled with research on native grasslands (Fargione et al., 2003; Smith et al., 2004) suggest niche overlap and complementarity in rooting depth may have played a role. Furthermore, plant colonization patterns on our roofs varied temporally and spatially during a single growing season, suggesting species differences in phenology and responses to microclimate may also have played a role in regulating colonization patterns. 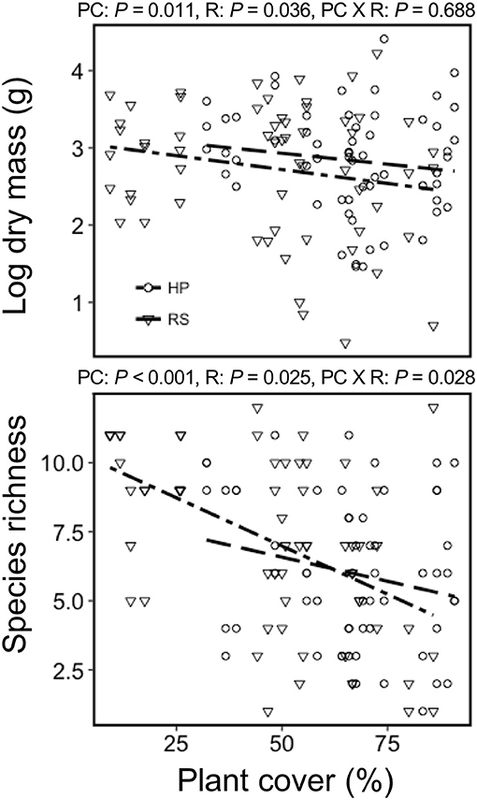 Consistent with our first hypothesis, colonist dry mass and richness declined with increasing resident plant cover in both the (HP) and the (RS) resident plant assemblages. This general pattern suggests that priority effects may have played a critical role in limiting colonization in our system, as in natural systems (Chase, 2003; Fukami, 2015). This inhibitory effect may reflect both the composition and abundance of the resident species assemblage. For example, colonist dry mass was larger in the HP compared with the RS treatment, and the decline in colonist richness with increasing resident cover was larger in the RS treatment. Nonetheless, the general decline in colonist cover with increasing resident plant cover is consistent with results from natural communities, such as grasslands (Foster, 2001; Milbau et al., 2007). This pattern also is commonly seen during species invasions, where invasiveness at local scales often is inversely proportional to resident species abundance or richness (Levine et al., 2004). The direct effects of resident assemblage composition on colonization in our study suggest that species-specific interactions between resident and colonizing species affected colonization, as often has been observed in studies on natural systems (Bresciano et al., 2014). In the current study, the larger colonist dry mass in the HP treatment was associated with a resident assemblage dominated by several C4 graminoids, compared with the RS treatment, where the assemblage was dominated by a C3 tuft graminoid and forbs. The contrasting patterns may reflect niche complementarity between the resident and colonizing species. Forb species accounted for 81% of the colonist dry mass collected from the HP treatment, with Rudbeckia hirta L. alone accounting for nearly 24% of the colonist dry mass. Rudbeckia hirta is a native, biannual/annual forb species that is shallow-rooted. By comparison, the C4 graminoids of the HP assemblage are perennial species that typically grow deep fibrous roots. Observations of excavated grasses on green roofs indicate that graminoid root density is low in the first several centimeters of growing medium (Simmons, 2015), suggesting that shallow-rooted species like R. hirta may have little root competition in the graminoid-dominated HP assemblage. These species-specific interactions also were observed in the C3 tuft graminoid and forb dominant RS assemblage, where graminoids accounted for 71% of the colonist dry mass and the introduced annual grass Digitaria sanguinalis (L.) Scop. alone accounted for 45% of the colonist dry mass. Accordingly, and consistent with studies on colonization and invasion in natural systems (Moles et al., 2008; Maire et al., 2012), the patterns of colonizing plant species in the two assemblages suggest that, while many disturbance-adapted species are likely to colonize green roofs that have established native plant assemblages, the characteristics of the resident assemblage and colonizers may be complementary. If so, growing medium depth may be expected to play a role in regulating interactions between resident assemblages and colonizing species. In addition to direct effects on below ground interactions among species, growing medium depth may have indirectly affected colonization in our study, as resident plant survival and growth increased with increasing medium depth in our study roofs (Aloisio et al., 2017). The observed effect of growing medium depth on colonization is consistent with previous studies that suggest that depth may affect the survival or growth of both resident and colonizing species. Further, the contrasting effect of growing medium depth on colonist dry mass between the HP and RS treatments is consistent with the disparate results of previous studies, which have observed increased (Madre et al., 2014) and decreased (Dunnett et al., 2008) colonist taxonomic diversity with increasing depth. Furthermore, both habitat filtering and niche differentiation in rooting depth has been shown to affect community assembly in natural grasslands (Maire et al., 2012). Taken together, these studies suggest that the effect of growing medium depth on colonization may differ among resident assemblages, at least under some conditions. Growing medium depth may have a larger effect in assemblages dominated by deep-rooted plants. Deeper growing medium may allow further stratification of roots in these assemblages, such as the HP treatment, where the abundant C4 graminoid roots may be associated with greater root abundance in the deepest areas of the growing medium while growing media near the surface remained available for colonists, such as the shallow-rooted R. hirta. In contrast, depth may have less of an effect in resident assemblages dominated by shallow-rooted resident assemblages, such as the RS treatment, where greater abundance of forbs and shallow-rooted C3 tuft graminoids may be associated with greater root density at the growing medium surface, which could limit growth of colonists independent of growing medium depth. Because the potential mechanisms through which growing medium depth interacted with resident assemblage in our study are speculative, further research is needed to understand potential interactions between growing medium depth and resident assemblage on colonization of green roofs. In particular, several factors beyond the composition of the resident assemblages may have minimized the effect of growing medium depth in our study, including the nature of the depth treatments, study duration, disturbance frequency, and microclimate. Madre et al. (2014) observed that colonist diversity increases as growing medium depth increases; however, our results indicate that a minimal (3.3 cm) difference in growing medium depth may lead to differences in diversity that are small enough that they are not statistically distinguishable. Our study also only ran for 2 years, and the plots experienced repeated disturbances, which may have led to annual species, which may be less sensitive to growing medium depth due to their comparatively small root systems, dominating the colonist species composition. Longer-duration studies may see a larger influence of more-competitive perennial plants with more extensive root systems. Microclimate may also regulate the effects of growing medium depth, through effects on the amount and timing of water available for distribution within the growing medium. Consistent with our third hypothesis, we observed seasonal differences in the dominant species of colonizing plants. The seasonal variation partly may have been an artifact of our sampling protocol, which involved repeated destructive sampling of colonists. Repeated disturbances (hand-pulling of colonists) may have favored disturbance-adapted species (Grime, 1979; Myers et al., 2015); however, colonist management is common on green roofs, especially during early establishment, and green roofs are subject to repeated drought disturbances that can drive changes in plant composition (Bates et al., 2013, 2015; Brown and Lundholm, 2015). Accordingly, different patterns of disturbance, or the absence of disturbance, could result in different patterns in colonist composition than those observed in the current study. Nonetheless, the shift in colonist composition from forb-dominant in June to graminoid-dominant in August suggests that colonist composition of green roofs planted with native plants may change over time. As in natural systems, temporal changes on green roofs may reflect successional dynamics, as later-colonizing species replace earlier-colonizing species as the dominant components of the community, as well as phenological differences among species and seasonal differences in environmental factors (Rowe et al., 2012; Nagase et al., 2013; Brown and Lundholm, 2015; Heim and Lundholm, 2016). Because our study only examined 1 year, and we did not address the drivers underlying the temporal patterns we observed, further research is needed to quantify the interactive effects among management, phenology, microclimatic variation, and succession on colonization dynamics in our system. While we did not address specific mechanisms, our results suggest both phenology and microclimate may have influenced the temporal variation we observed. Plant species in the Fabaceae accounted for about 70% of colonist dry mass in June, but only about 0.1% in August. By August, C4 graminoids, Digitaria sanguinalis (L.) Scoop, Eragrostis pectinacea (Michx.) Nees ex Steud, and Setaria viridian (L.) P. Beauv., were the most abundant. These results are generally consistent with Köhler (2006), who observed that nitrogen-fixing species from the Fabaceae family were indicator species of “wet” conditions and “wet” years, while graminoids were more common during “dry” years over the course of a 20 year study of two green roofs in Germany (originally planted with sedum). While growing medium moisture content was not measured directly in the current study, weather data from Central Park, NY, USA (NOAA) indicate that 2012 total monthly (March-August) precipitation was below 30 year averages, except May, and mean temperature was 1.4°C above 30 year averages. These data suggest that a warm spring and a precipitation pulse in May could have driven the forb and Fabaceae abundance observed in June, followed by hotter and drier than average temperatures that favored graminoid germination and growth in July and August. Consistent with our fourth hypothesis, colonist composition differed among the green roofs in this study. Plant species composition and distribution in cities is highly heterogeneous (Vincent and Bergeron, 1985; Godefroid and Koedam, 2007), so it is likely that the propagule pools differed among the green roofs in the current study. However, while this may have caused composition to differ among roofs, there was no observed relationship between the proportion of plant cover surrounding green roofs and the total colonist richness on the green roofs. Madre et al. (2014) also observed no clear relationship between total colonist richness and the proportion of plant cover around green roofs. These results suggest that green roof plant colonization does not depend on the amount of green space surrounding roofs. However, research on highly mobile insects suggests that the landscape surrounding a green roof is important in shaping green roof invertebrate communities (Braaker et al., 2017), which, in turn, serve as prey for birds (Partridge and Clark, 2018). In the current study, animal dispersed plant colonist species were abundant, suggesting that the role of the surrounding landscape on plant colonization could be related to landscape variables not measured. For example, plants occupy many anthropogenic surfaces, including vertical surfaces and small cracks in pavements, in urban ecosystems (Lundholm, 2011) that may have not been captured through our analysis. One other possible propagule pool in the current study is the seed bank. While we did not quantify the seed bank for the current study, growing medium sourced from the same materials was used for all roofs, yet plant composition still varied, suggesting that colonization from the surrounding landscape is one of the drivers. Further, in a study using the same green roofs used in the present study, native plant survivorship differed among roofs and decreased with increased solar radiation (Aloisio et al., 2017). This pattern suggests that differences in microclimate among roofs affected the cover of resident assemblages, which, as we have already discussed, strongly affected colonization dynamics. The observed effects of resident cover also have implications for management of green roofs. The inverse relationship between resident plant cover and colonization across treatments suggests that establishing and maintaining extensive native plant cover may help to limit colonization. Conversely, if native plants on green roofs are not sustained through adequate maintenance (watering, fertilizing, hand-pulling of colonists), colonists may become abundant and could outcompete resident native plant species over time. If the desired outcome is a native plant assemblage, it may be particularly important to remove colonist species during early stages (year 1 and 2) of plant establishment on green roofs, when seedlings are small and native cover is small. Even if multiple roofs are established with the same initial parameters, differences in initial colonization of these roofs may lead to alternate trajectories and result in different community compositions, with cascading effects on vegetation structure and ecosystem services. Despite the aesthetic, economic, and environmental benefits of green roofs (Oberndorfer et al., 2007), the conservation value of establishing native plant assemblages on green roofs is not yet clear (Williams et al., 2014). While there is a great deal of interest in using native plants on green roofs, green roofs are a constructed ecosystem composed of materials that do not mimic any native habitat precisely (Lundholm, 2015), and previous studies indicate that establishing native plants on green roofs can be difficult (see Butler et al., 2012). The current manuscript further illustrates this challenge by suggesting that recently-established native plant assemblages on green roofs are subject to intense colonization by common cosmopolitan species. These cosmopolitan species may be better adapted to the constructed green roof ecosystem and, depending on their traits, may provide more ecosystem functions compared with native species (Lundholm et al., 2014). Nonetheless, stakeholder (e.g., roof owner) preferences are likely to drive management plans to meet desired outcomes. Different types of green roofs (e.g., agricultural vs. extensive) and different types of planting combinations will, to varying degrees, meet the various aesthetic, economic, and environmental goals defined by stakeholders. For example, brownfields are considered to have conservation value in the United Kingdom. Brown roofs (also referred to as biodiverse roofs) are designed to mimic brownfields and use a heterogeneous substrate layer of recycled demolition aggregate that is colonized by plants from a seed mix or the surrounding environment (Bates et al., 2013). Plant management on brown roofs may be minimal, but the aesthetics of the brown roof, or green roofs with minimal management, may be unpredictable as these roofs may become dominated by plants that are less aesthetically pleasing compared with a more-highly managed green roof (Dunnett et al., 2008; Southon et al., 2017). In the current study, the primary stakeholder was the NYC Department of Parks and Recreation. Their goal in establishing the study green roofs was to evaluate specific native plant assemblages for use on green roofs, including the degree to which colonization would need to be managed to maintain each assemblage, with the intention of establishing protocols for large-scale implementation and management. Our results, coupled with those of our previous research on native plant survivorship on these roofs (Aloisio et al., 2017), are critical steps toward understanding how to establish native assemblages on green roofs. The results from this study indicate that disturbance-adapted species are likely to colonize green roofs and the composition of resident native species assemblages on green roofs strongly affects patterns of colonist composition. While colonization may initially increase total plant biomass and richness through niche complementarity, colonization by cosmopolitan urban species could competitively exclude native species over time. In either case, colonization, and the management of colonization, will likely have cascading effects on vegetation structure and ecosystem function that will be further mediated by temporal and spatial effects. Site-specific planning and management of green roofs planted with native assemblages could help mitigate compositional changes, as our results, coupled with previous studies (e.g., Madre et al., 2014), suggest that site-specific characteristics, such as growing medium depth, will affect the colonization of planted assemblages. Therefore, we recommend more research addressing the factors that regulate colonization of planted green roofs, particularly those that are managed to preserve and promote local biodiversity. JA designed and executed all aspects of this work under the advisement of MP, AT, and JL. All authors participated in writing and editing this article. The research was funded in part by a grant to JL through the National Science Foundation Research Experience for Undergraduates program under Grant No. 1063076. Funding was also provided by Fordham University's Louis Calder Center, Department of Biological Sciences, Graduate School of Arts and Sciences, Graduate Student Association, and Office of Research. Plots and plants used in the project were contributed by the New York City Department of Parks and Recreation, through the Green Apple Corps and Green Belt Native Plant Center, respectively. We thank New York City Department of Parks and Recreation, especially the leadership of Artie Rollins, Bram Gunther, and Ed Toth, for their partnership in this research, and Brian Aucoin and the NYC Parks Green Apple Corps for plot installation. We also thank Michael Kavanagh for his assistance with field work. Barkworth, M. E., Anderton, L. K., Capels, K. M., Long, S., and Piep, M. B. (2013). Manual of Grasses for North America. Boulder, NV: University Press of Colorado. Bates, D., Maechler, M., and Bolker, B. (2012). lme4: Linear Mixed-effects Models Using S4 Classes. R package version:1.1-19. Clemants, S., and Moore, G. (2003). Patterns of species richness in eight northeastern United States Cities. Urban Habitats 1, 4–16. Del Tredici, P. (2010). Wild Urban Plants of the Northeast. Ithaca: Cornell University Press. Edinger, G. J., Evan, D. J., Gebauer, S., Howard, T. G., Hunt, D. M., and Olvero, A. M. (2002). Ecological Communities of New York State: A Revised and Expanded Edition of Carol Reschke's Ecological Communities of New York State. Albany, NY. Grime, J. P. (1979). Plant Strategies and Vegetation Processes. London: Wiley. Köhler, M. (2006). Long-term vegetation research on two extensive green roofs in Berlin. Urban Habitats 4, 1–24. Kuznetsova, A., Brockhoff, P., and Christensen, R. (2013). lmerTest: Tests for Random and Fixed Effects for Linear Mixed Effect Models (lmer objects of lme4 package). R package version:2.0–0. Lundholm, J. (2011). “Vegetation of urban hard surfaces,” in Urban Ecology: Patterns, Processes, and Applications, ed J. Niemela (New York, NY: Oxford University Press), 93–102. Magee, D. W., and Ahles, H. E. (1999). Flora of the Northeast: a Manual of the Vascular Flora of New England and Adjacent New York. Amherst, MA: University of Massachusetts Press. Monterusso, M. A., Rowe, D. B., and Rugh, C. L. (2005). Establishment and persistence of Sedum spp. and native taxa for green roof applications. HortScience 40, 391–396. Oksanen, J., Blanchet, F. G., Kindt, R., Legendre, P., Minchin, P. R., O'Hara, R. B., et al. (2013). vegan: Community Ecology Package. R package version 2.0-9. Simmons, T. M. (2015). “Climates and microclimates: challenges for extensive green roof design in hot climates,” in Green Roof Ecosysstems, ed K. R. Sutton (Cham: Springer International Publishing), 63–80. Swain, P. C., and Kearsley, J. B. (2001). Classification of Natural Communities of Massachusettes. Westborough, MA. Uva, R. H., Neal, J. C., and DiTomaso, J. M. (1997). Weeds of the Northeast. Ithaca, NY: Cornell University Press. Copyright © 2019 Aloisio, Palmer, Tuininga and Lewis. This is an open-access article distributed under the terms of the Creative Commons Attribution License (CC BY). The use, distribution or reproduction in other forums is permitted, provided the original author(s) and the copyright owner(s) are credited and that the original publication in this journal is cited, in accordance with accepted academic practice. No use, distribution or reproduction is permitted which does not comply with these terms.